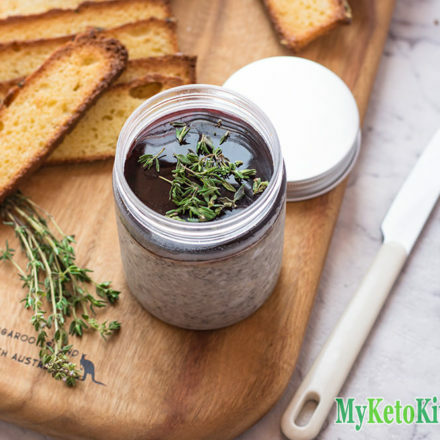 This easy Low Carb Meat-Free Mushroom Pate is a tasty vegetarian version of the French classic. It’s a great game day snack or addition to a cheese platter. We’ve served ours with our Foccacia Bread (topped with parmesan and thyme) and our Marinated Bocconcini. I have not included the jellied top in the recipe, but it is very easy to make! Reserve 100ml/3.5 ounces of the liquid used to soak the mushrooms, sprinkle in 1 teaspoon of gelatin and pour over the chilled pate. Let to set for 1 hour. This recipe makes 12 serves of approximately ¼ cup. Place the dried mushrooms in a heatproof bowl and pour over enough boiling water to cover them. Set aside for 10 minutes. Place the butter, onion, garlic, thyme and salt in a large frying pan over medium heat. Slowly saute the onions until they are translucent but not browned. Add the mushrooms and stir to coat in the butter. Cook the mushrooms for 15 minutes until they have softened. Remove 2 tablespoons of the water from the dried mushrooms and add to the frying pan. Drain the rest of the water and add the mushrooms to the frying pan, stir well and drop the heat to low. Continue to cook the mushrooms for another 10 minutes before turning off the heat and leaving them aside to cool for 20 minutes. Add the mixture from your frying pan into your food processor, along with the sour cream, lemon juice, extra butter and pepper. Blend into a smooth paste and add extra seasoning as desired. 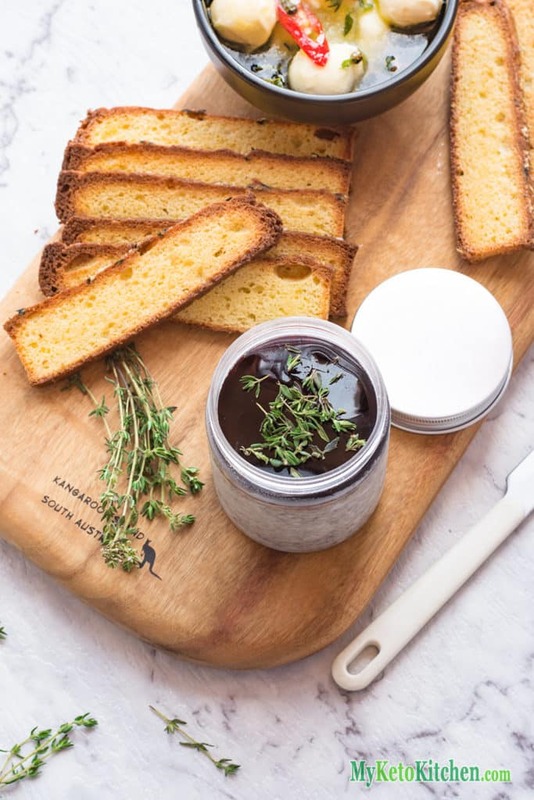 Spoon the pate into small jars or ramekins, cover and set in the fridge for at least 4 hours. 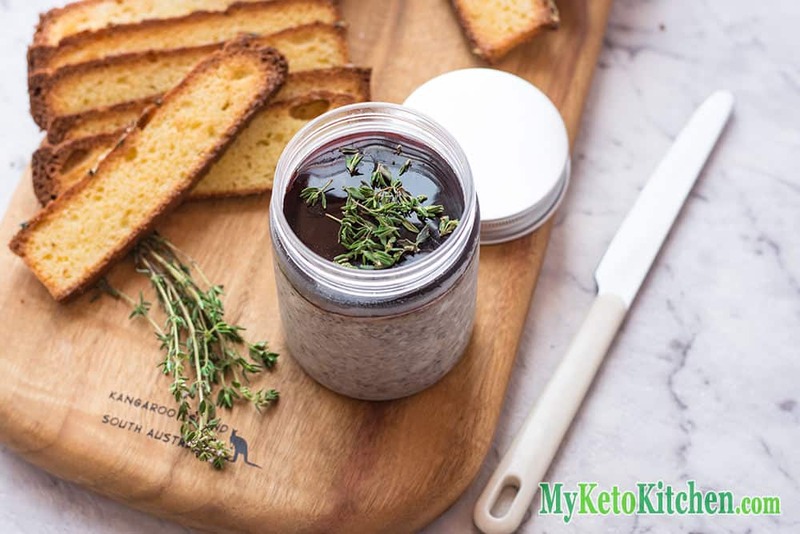 Serve with Sesame Keto Crackers or toasted slices of Olive Focaccia. 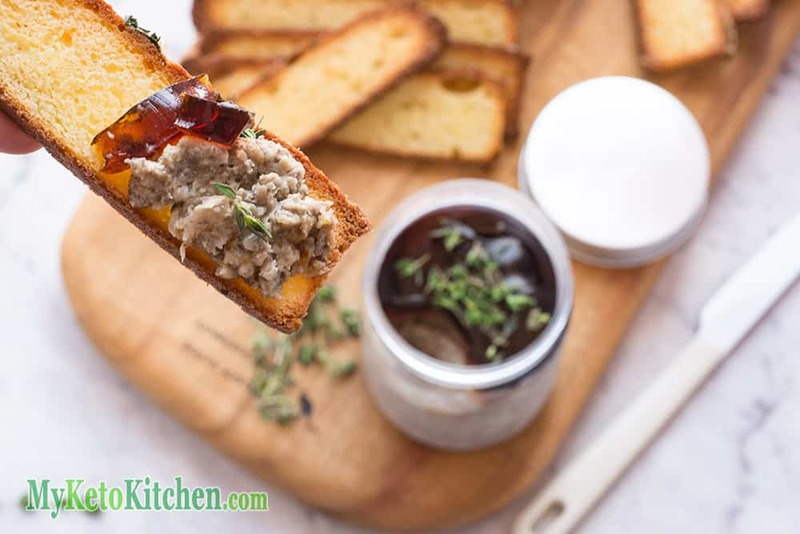 If you want to make a larger batch of Low Carb Meat-Free Mushroom Pate, simply adjust the serving amounts in our easy to use recipe card below. 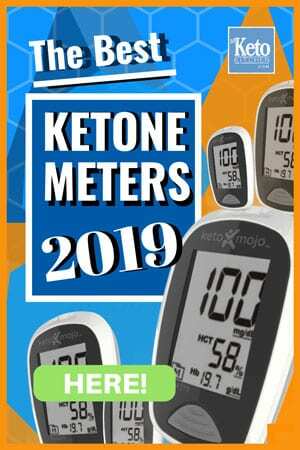 The measurements and ingredients will adjust themselves, and all you have to do is follow the method. Remove 2 tablespoons of the water from the dried mushrooms and add the the frying pan. Drain the rest of the water out and add the mushrooms to the frying pan, stir well and drop the heat to low. Serve with Sesame Keto Crackers, or toasted slices of Olive Focaccia.